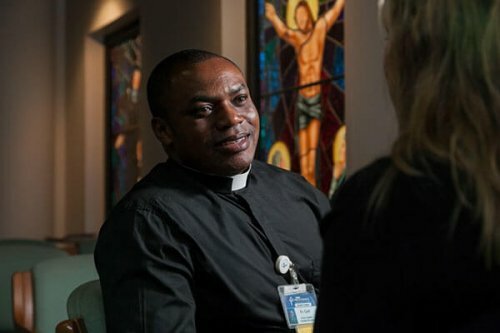 Chaplains are available to all patients, residents, families and staff anywhere in Ascension Providence. Chaplains provide healing presence and support, pastoral counseling and prayer. Our chaplains attempt to visit all patients within 24 hours of their admission to Ascension Providence. Ascension Providence Chapel at the hospital and Christus Chapel at Ascension Providence Park are always open. You are welcome to come in at any time. Ascension Providence Park Christus Chapel Services Sunday 9:30 a.m.
Monday - Friday 10:00 a.m. Sunday 10:45 a.m. Confessions before Mass first Friday of month or any other time by appointment. Lord, you fill us with your love. Foster in us a love for all people. Please, Lord, do not allow us to be tested beyond our ability. Strengthen the weak, heal the sick, raise up the fallen, comfort the sorrowful, free the captives. Guide and bless all of us in our care and service to others that we may bear fruit that will last. Amen. Monday – Friday: 7 a.m. – 6:00 p.m. Chaplains are on call at times other than those above. If you would like to see a chaplain and they are not in their offices, please call the hospital operator and have one of the chaplains paged.